Three-dimensional (3D) television sets are already on the market and are becoming increasingly popular among consumers. Watching stereoscopic 3D movies, though, can produce certain adverse affects such as asthenopia and motion sickness. Visually induced motion sickness (VIMS) is considered to be caused by an increase in visual-vestibular sensory conflict while viewing stereoscopic images. VIMS can be analyzed both psychologically and physiologically. According to our findings reported at the last HCI International conference, VIMS could be detected with the total locus length and sparse density, which were used as analytical indices of stabilograms. 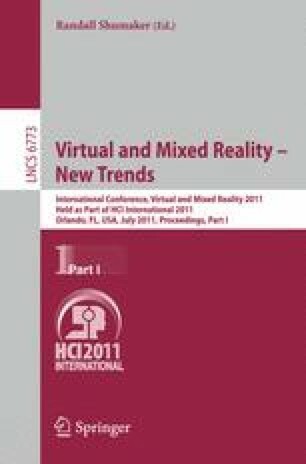 In the present study, we aim to analyze the severity of motion sickness induced by viewing conventional 3D movies on a liquid crystal display (LCD) compared to that induced by viewing these movies on a head-mounted display (HMD). We quantitatively measured the body sway in a resting state and during exposure to a conventional 3D movie on an LCD and HMD. Subjects maintained the Romberg posture during the recording of stabilograms at a sampling frequency of 20 Hz. The simulator sickness questionnaire (SSQ) was completed before and immediately after exposure. Statistical analyses were applied to the SSQ subscores and to the abovementioned indices (total locus length and sparse density) for the stabilograms. Friedman tests showed the main effects in the indices for the stabilograms. Multiple comparisons revealed that viewing the 3D movie on the HMD significantly affected the body sway, despite a large visual distance.